West Indies will be touring New Zealand in December 2017 for two Test matches, three ODIs, and three T20I. Initially, three Test matches were planned but one Test match is dropped by New Zealand Cricket conform the ICC Test Championship rules which will be commencing in 2019-20. The two Tests will be played at Basin Reserve, Wellington and Seddon Park, Hamilton. First ODI will be hosted at Cobham Oval (New), Whangarei; which will host its 2nd International Cricket match, first one hosted between New Zealand and Zimbabwe way back in February 2012. The other two ODIs will be played at Hagley Oval, Christchurch. Saxton Oval, Nelson will host the first T20I and the latter two will be hosted Bay Oval, Mount Maunganui.The third ODI will be played on Boxing day (December 26) at Christchurch. And the second T20I will be played on the New Year Eve at Mount Maunganui. Two practice matches are also scheduled for West Indies; one three-day practice-match before 1st Test match from 25th November 2017 to 27th November 2017 against New Zealand A. 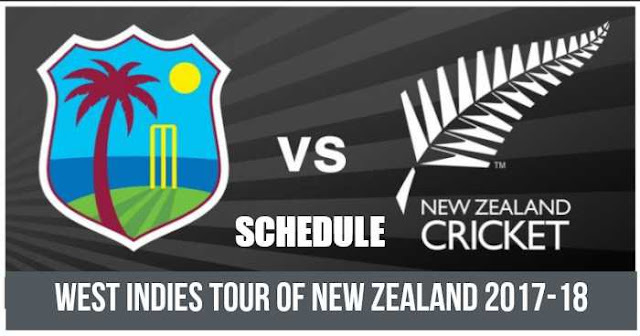 And another one-day practice match against New Zealand XI on 17th December before ODI matches.